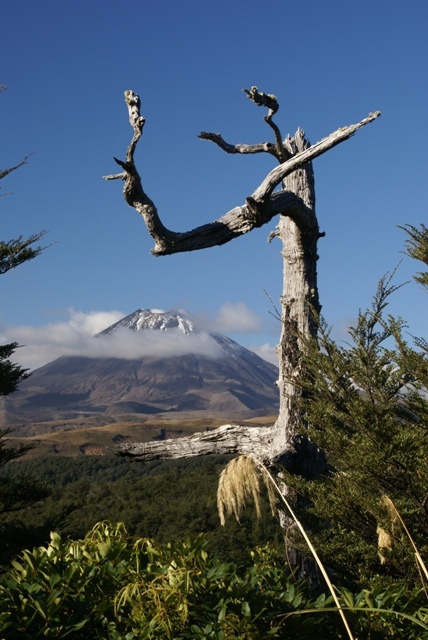 The Tongariro National Park covers an area of about 3,000 sq miles and is one of only a handful of sites worldwide with dual World Heritage status - for its natural and cultural value (the area is very significant to Maori culture). 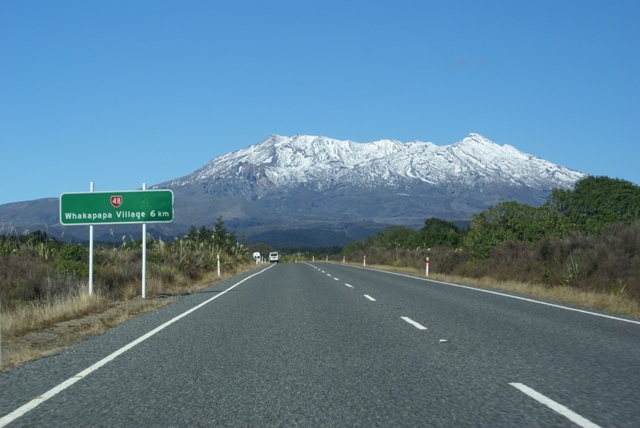 It includes 3 major active volcanoes - Mt Tongariro at 6,400 ft high, Mt Ngauruhoe (used for Mt Doom in Lord of the Rings) at 7,445 ft and Mt Ruapehu at 9,090 ft - the highest mountain in the North Island, with 8 glaciers on its slopes. 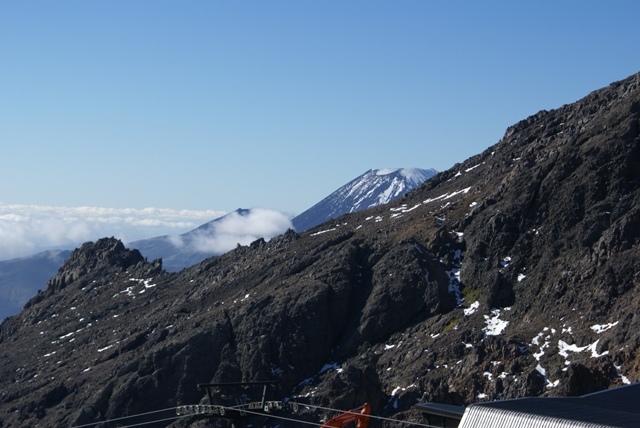 Although they are active and smoldering away nicely (the last major eruptions were only 12 years or so ago), they have tramping tracks around them and Mt Ruapehu is the skiing centre of New Zealand, with many ski slopes and ski lifts. There's supposed to be a good early warning system for eruptions. 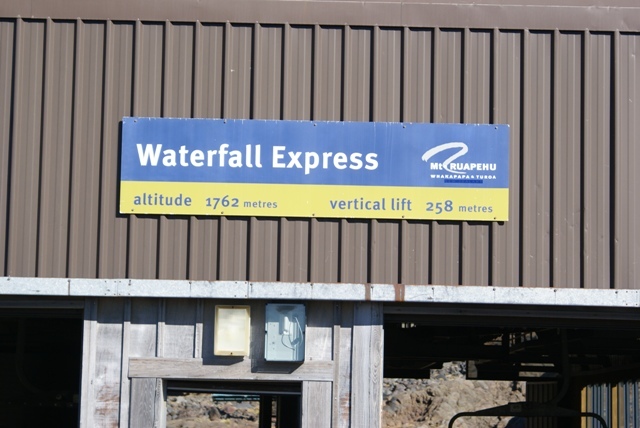 We hoped that worked as we headed for the very small village of Whakapapa where it all happens. It was another fine day with bright blue sky and sunshine. 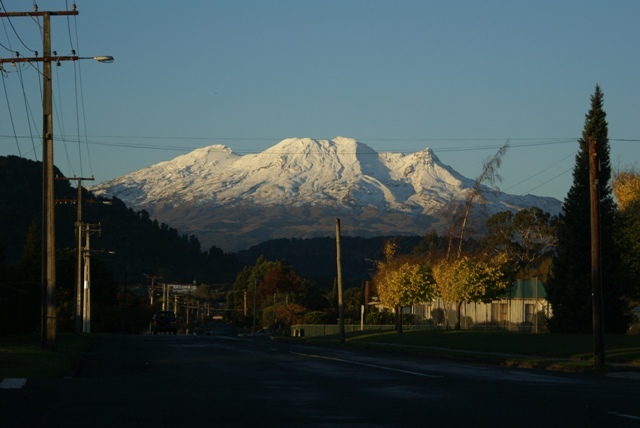 It had snowed a few days earlier and the top of the mountain was covered in snow, adding to its beauty. So a quick decision was made to drive on further up the mountain to have a look at the ski lifts which run in the summer to take trampers and climbers up the mountain. They turned out to be chair lifts - what to me, who's not that keen on heights, looked like a little 2 seater basket hanging on a pole. But having such good weather, another quick decision was made to buy tickets to go up as far as we could go. Not so good was that we were then told that we would have to wait 30 minutes as the top lift had broken down! One of my worst nightmares is to get stuck hanging high above the ground in one of these things. So not an enjoyable wait. But having been assured they'd fixed it, off we went on our first ever chair lift, having first put coats and over-trousers on - they said that with the wind it was going to be a very cold ride. Once used to the motion, it was fantastic. 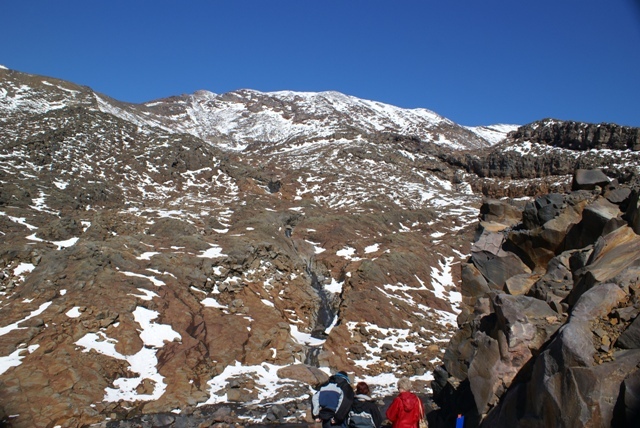 The views were spectacular, both looking up to the snow-capped peak and down into the valley. We even got off the first lift and onto the 2nd without any hesitation! 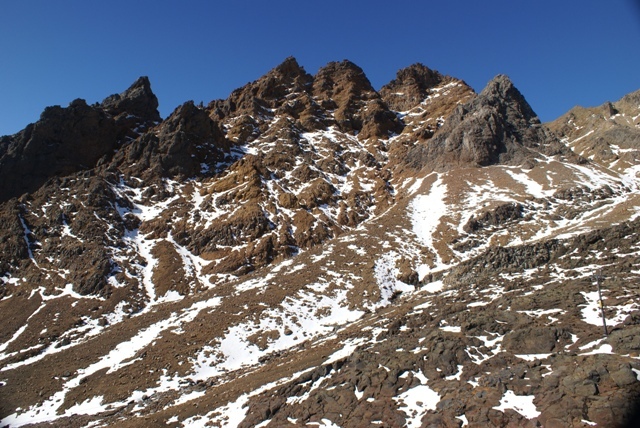 The second chair lift takes you up to 6,565 ft where we were able to climb on the partly snow covered mountain and take in the magnificent views down around us and up at the white snow-covered mountain against the bright blue sky. Quite an experience for us from the flat lands of southern England. Later, when coming down in the chair lift and facing down the mountain, we had the video camera running the whole time to catch the views. Once down there was just time to try and drive right round the roads that circle the national Park, so we could see the mountains from all sides. At least we thought there would be time - the last half an hour was in the dark, so not quite a perfect day, but not bad! 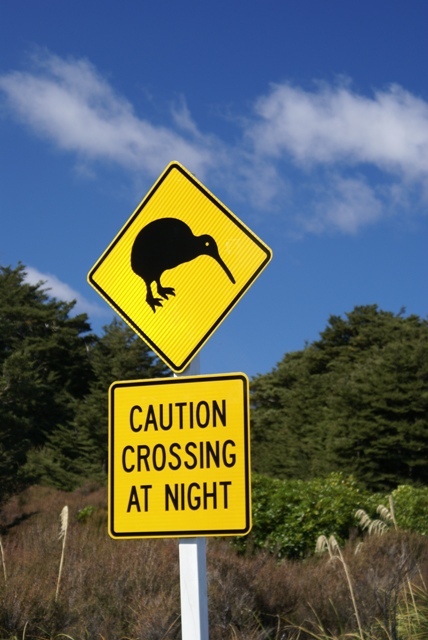 As an aside, village names in NZ can sometimes be a little lacking in inspiration. One of the villages on the road surrounding the National Park is called 'National Park', a bit like the village at the Fox glacier being called 'Fox Glacier'. Still, they're a lot easier to pronounce than most of the names here! 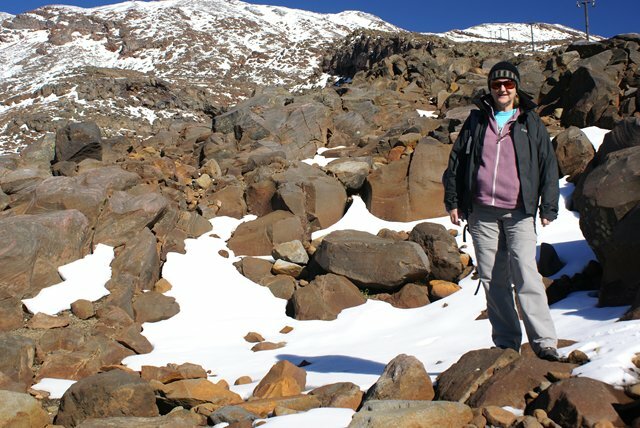 The perfect volcanic cone of Mt Doom (Mt Ngauruhoe), 7445ft high and not a hobbit in sight! on the mountain we kept stopping to take photos in case it clouded over by the time we actually got to it. We didn't have to worry - no clouds all day. they're about in this area. 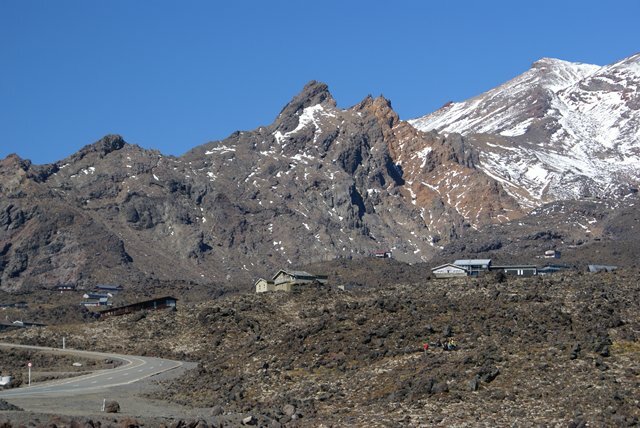 Base camp - the ski centre where the road ends. To go any higher you have to walk, or get a lift! 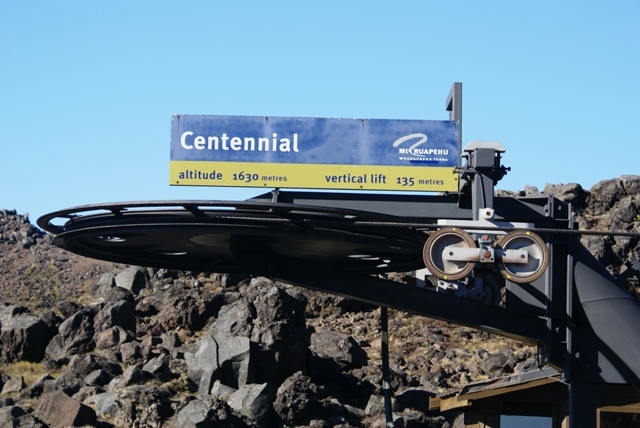 The first chair lift, starting at 5,298ft and rising 439ft. 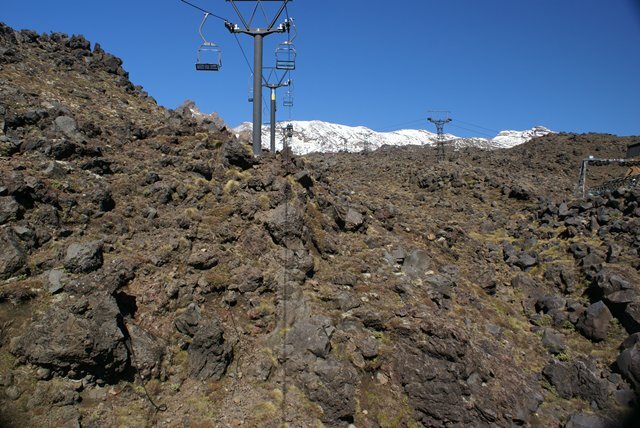 The second chair lift, at 5,727ft, rising another 839ft, to 6,565ft (2020 metres). 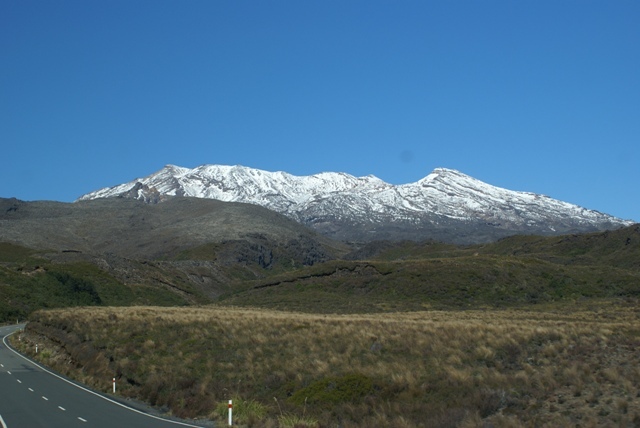 Above and below, the barren, rugged scenery looking up Mt Ruapehu to the blue sky above. 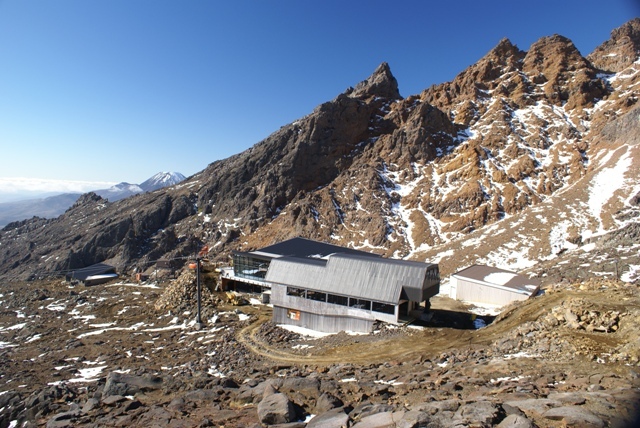 Looking down on the top chair lift station, and behind it a new cafe/restaurant is being built. Mt Doom is off to the left. 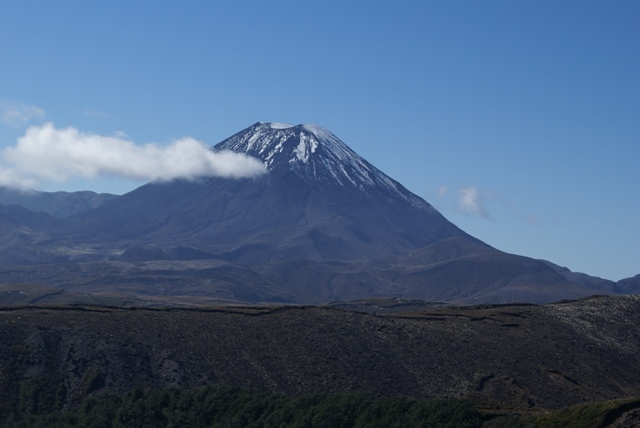 Mt Doom and, with a bit of cloud in the way, Mt Tongariro. every direction, except the last bit, when it was dark!